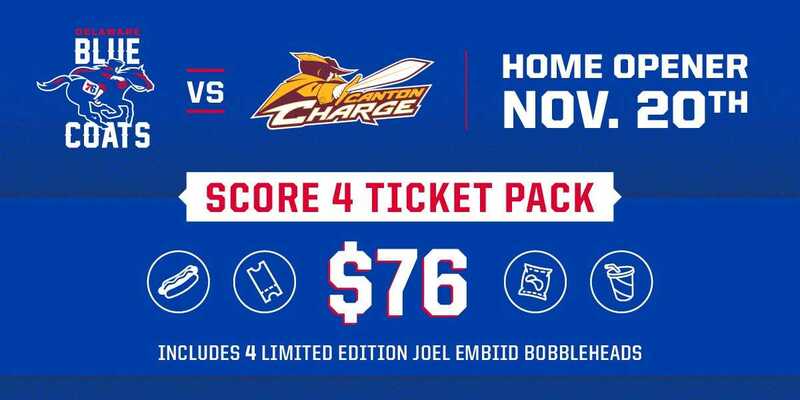 PHILADELPHIA – NOV. 16, 2018 – The Delaware Blue Coats announced today special discounts and game details for its first-ever home opener on Tuesday, Nov. 20 when the team hosts the Canton Charge at 7:00 p.m. at The Center (3601 S. Broad Street, Philadelphia). 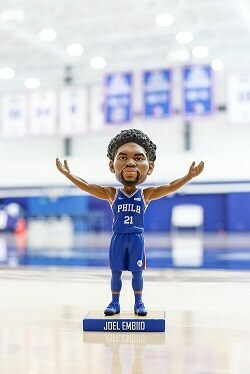 Not only will fans at the gate receive a figurine of 76ers All-Star Joel Embiid, but parking will be available free of charge and center-court tickets can now be purchased via the “Score 4” pack. The newly-created “Score 4” pack offers families and friends the opportunity to purchase four center-court game tickets, which will be accompanied by four bobbleheads, four hot dogs, four bags of chips and four sodas. The offer is available now by clicking HERE and costs $76. Single-game tickets are still available for purchase at SIXERS.COM/BlueCoats. The Broad Street Atrium at The Center will feature interactive games and activities in addition to select Blue Coats merchandise in the team store. Further, the team will be introduced via a brand-new intro video, with the starting lineup taking the floor from the tunnel nearest the team bench, as seen at 76ers home games. Sixers ENT, including the Sixers Dunk Squad presented by Dunkin’ Donuts and mascot Franklin, will be part of the Blue Coats home opener as 76ers Game Presentation will be fully integrated throughout the night. Sixers Stixers, the talented percussion group often seen at 76ers’ home games, is set to perform as well. The Blue Coats are led by Demetrius Jackson, who is signed to a two-way contract and plays for both Delaware and its parent club, the Philadelphia 76ers. Jackson holds team-high averages of 29.3 points (sixth in the G League) and 9.0 assists per game (second in the G League) across three contests. In the season opener at Raptors 905, the former Notre Dame star tallied 38 points (14-26 FG), six rebounds and 13 assists in 40 minutes of action. Canton features a former Irish teammate of Jackson’s in Bonzie Colson, who holds averages of 16.3 points and 8.0 rebounds per game.